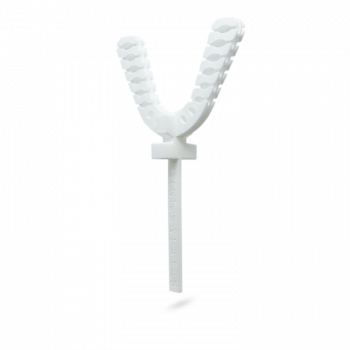 A single use disposable bite registration tool to assist with recording the 5mm vertical bite clearance for ordering O2Vent® oral appliances with the proprietary airway. The flexible nylon lattice surface design accommodates the patient’s curve of Spee (mandibular occlusal plane) and curve of Wilson (the upward [U-shaped]) curvature of the maxillary and mandibular occlusal planes. DOUBLE SIDED – to record an edge to edge bite registration. SINGLE SIDED - to record the protrusive bite registration using a suitable bite measurement tool that allows incremental and reversible advancement of the patient’s mandible anteriorly, with respect to the maxilla.